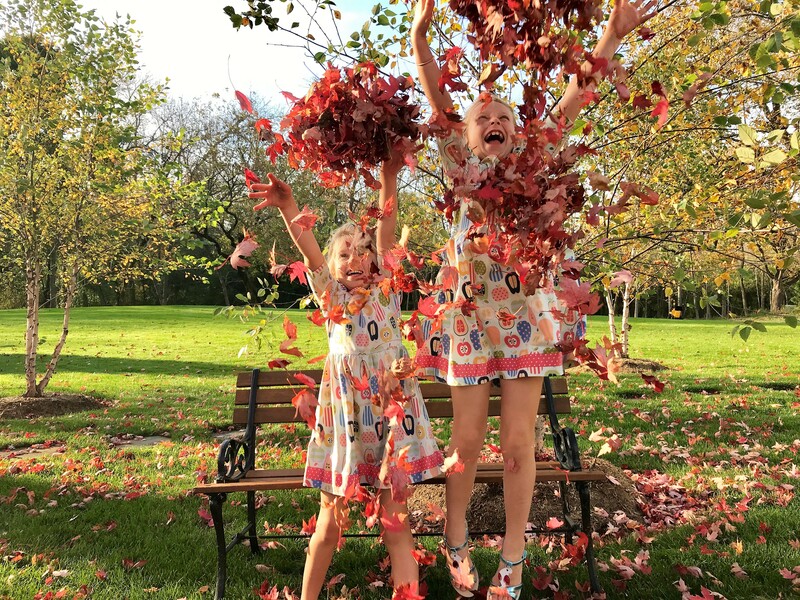 Wow, is it actually cool enough to start the annual Fall Cleanup?? The warmer-than-usual weather recently had many of our plants confused! 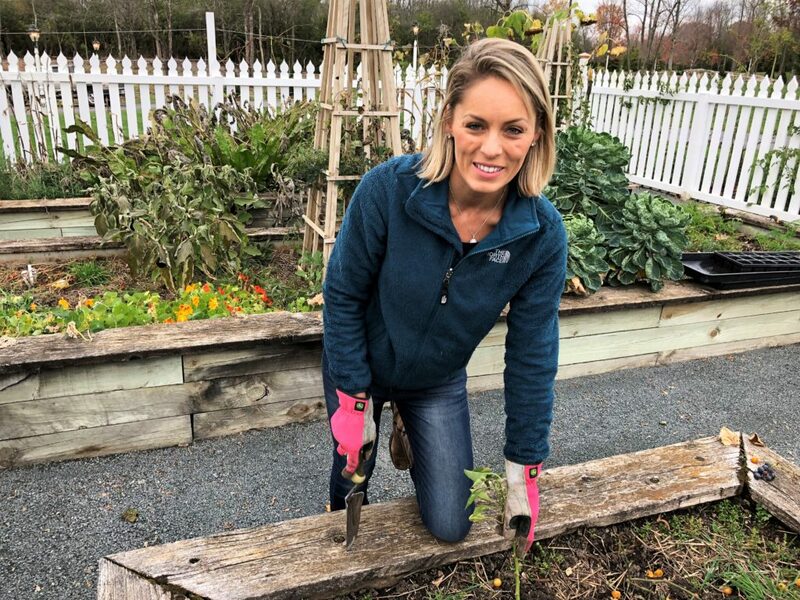 However, now that night time temps are dipping into the 40s, that is definitely your cue to get out there and get the yard and garden ready for the upcoming winter weather. There is something very satisfying about pulling the plants that have started to turn brown and are no longer in their prime. 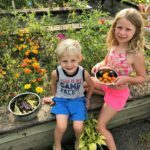 Our growing season is not incredibly long, so my August and September are mostly spent canning and preserving all of the extra fruits and vegetables that we cannot eat right away, since many things ripen all at once. And we are left with a rewarding cellar stocked with all sorts of goodies to enjoy over the year! So just as it feels so good to get the spring planting underway, it feels great to wrap it up, clean it up, and take a break from some of the outdoor summer tasks. So bust out your fleece, your gloves, and the weed bin and lets get started! Remember, this does not all have to be done in one day. Break up the tasks over 2 or three weekends and involve the whole family. 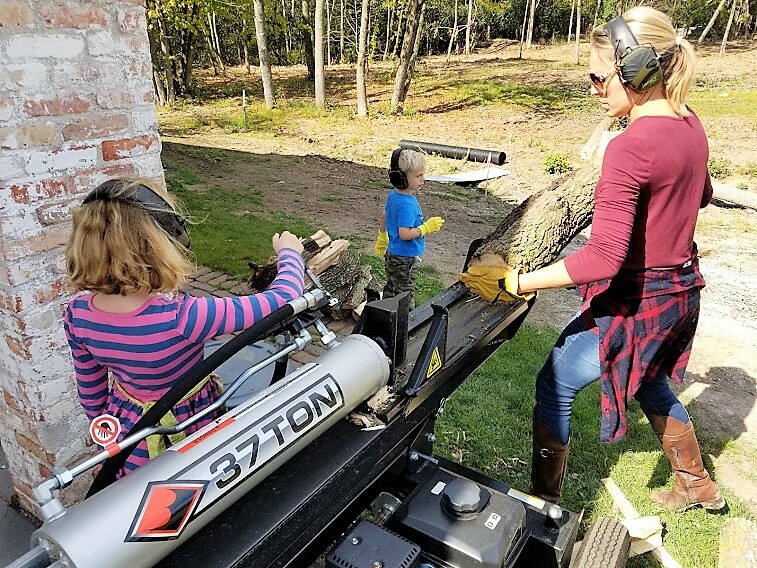 Our kids help us with most of these things (that don’t involve sharp tools). Honestly, they may complain about it every now and then- what kid doesn’t- but overall, they just want to help us out and be involved in whatever we are doing. They enjoy learning how to do different things and we enjoy teaching them. 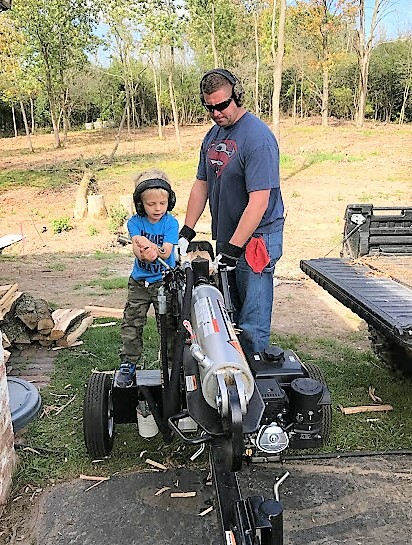 Duke & Daddy running the log splitter. Shut down any sprinkler systems or drip lines. Blow out or drain out all water because water in the lines over the winter can expand and crack them. 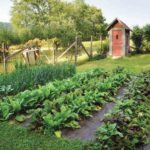 Pull all annual vegetables (which should eliminate a lot of the bugs and slugs that are probably feeding on them by now) and any rotten fruits or vegetables. Some people compost this material, but I get rid of it. 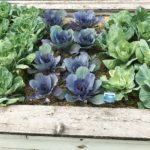 This helps eliminate the chances that leaf spot, blight, or other pesky fungi will return to the garden next year. 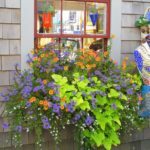 Leave herbs like chives, thyme, and mint (I cut mine back a bit) in the garden and they should come back next season, but feel free to dig up other herbs to plant in pots for the window sill of your kitchen. 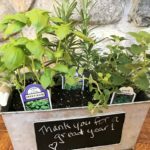 I am definitely looking forward to smelling my rosemary, basil and lemon balm every morning this winter! Yes ma’am! Adding a layer of compost now will help prepare your soil for spring. I also pile on the fallen leaves from the yard, any old hay, etc, to suppress weeds, keep the soil moist, and to provide enrichment as the leaves decompose. If you’re really on top of it, planting a cover crop a few weeks ago (sorry, I’m a bit late with this one!) would help maintain healthy soil, suppress weeds, and help control pests and diseases. Here is a good article from Rodale’s Organic Life. Plant rhubarb and garlic now. Time to start the garden cleanup! I’ll leave the brussel sprouts for a couple weeks yet, as well as the huge floppy greenish-brown horseradish leaves in the very back. I’ll give those a few more weeks before I dig some up. Trim spent perennial foliage down to the ground; this sends energy to the roots, for next season. Every three years, divide crowded tuberous plants, like irises and daylilies: More space means more flowers. If you have blooming perennials like clematis or roses, now is the time to prune them and train the branches. Hydrangea- I never prune these in the fall because, depending on the type, you risk pruning off all of the buds for next years flowers. I prune most of mine in early spring or late summer (or not really at all). I’ll go through this in another post in the spring. Fall is actually a great time to plant shrubs and trees. Cool weather and moist soil gives the roots a head start on getting established before the tree or shrub needs to bud/leaf out next spring. 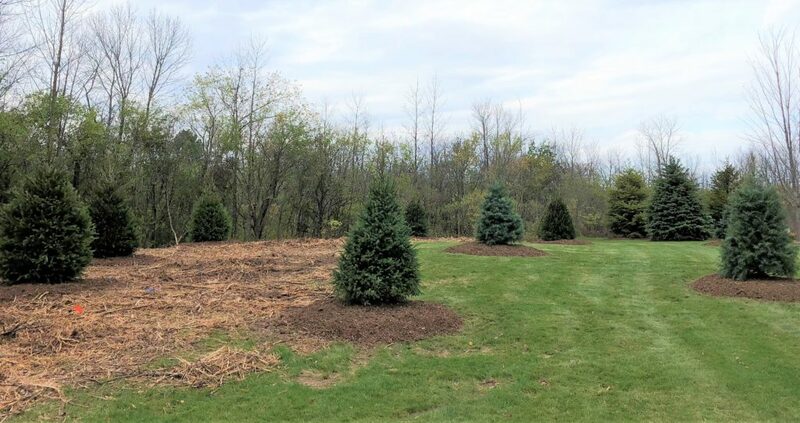 We are actually planting a number of spruce trees this week, and last year we planted over 30 deciduous trees of varying types (maple, oak, hackberry, birch) in October that were stunning this year! Check out our list of trees for great spring color. Trim any dead or broken shrub and tree branches to prevent further damage from heavy snow. Protect cold-sensitive plants, like roses, with an extra layer of mulch/leaves. Pull any potted plants and window boxes and store in the garage or flip upside down. If they are left outside to fill with ice and snow they may crack. We had a variety of 5-6ft spruce trees planted this week, including: Norway, Blackhills, Concolor, and Serbian. They should really take off and fill in nicely over the next few years. Rake up all of the leaves and save them in a large bin to cover your garden and help insulate small shrubs. The bin should have hole in the bottom so water does not pool. 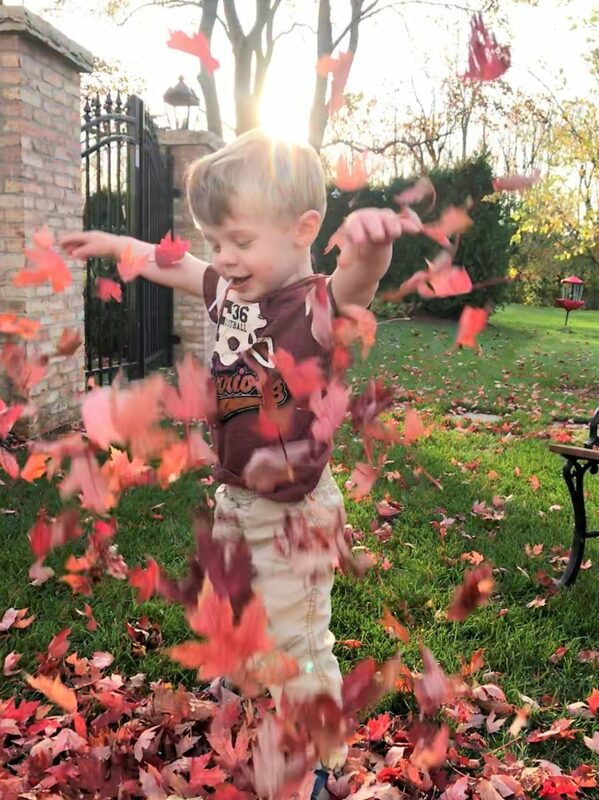 Turn the leaves with a shovel or “pitch fork” type of tool until you’re ready to use them. Or rake them up, shred them, and use them as mulch for young trees, shrubs, and flower beds. Mow the lawn to keep leaves from getting hung up in it. The less things that get stuck in the grass, the less of a chance for pests and diseases. Fertilize one last time. Feeding you grass now will give it a head start for next year. Aerate your lawn- what?!? Ok, we have never done this before, but I have read in many places that it works great for creating and maintaining a healthy lawn. If rainfall pools on the grass, aerating compressed soil allows water and nutrients can reach the roots. A garden fork can do the job on a small yard, but for larger lawns you can rent a walk-behind aerator that pulls out 2½-to 3-inch-deep soil plugs, which will break down naturally by spring. Sweep off/clean off the deck to prevent rot. Coil up and store all hoses. This may also be a good time to string trees with inconspicuous Holiday lights so you can avoid doing it when it gets really cold out! Split and stack wood in a covered location near the house for this winter’s warm, cozy fires. Ok, are you exhausted yet?!? !You likely will not need to do all of these things, but hopefully it keeps you from forgetting something important!